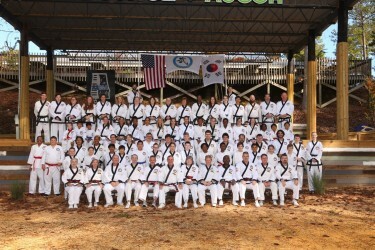 Black Belt Camp began with the highly anticipated test and review in the Grand Pavilion. Despite the cool, damp weather, participants displayed great motivation and energy during their Dan Shim Sa. Concurrently, red and blue belt students learned the ways of the camp and underwent forms review with Masters Navarra and Watson, who were assisted by those selected to help from the Instructor Training Symposium held earlier that day from 9 am until 4 pm. The events of the Dan Shim Sa were capped by the outstanding performances of the mother and son duo of Kris and Ryan McGovern of Karate World of North Georgia that respectively earned the adult and youth best testing student awards. One of the greatest opportunities afforded to Black Belt Camp attendees is the chance to learn from new instructors and to explore areas of interest with them. For students, it is the ability to learn something they would not normally be exposed to or to learn something they are familiar with but from a contrasting perspective or philosophy. Black Belt Camp 2018 featured a broad range of techniques from Kwan Jang Nim, Masters, and Sah Dan instructors. A sampling of the specialized training that was offered included: Masters Akong (Sparring Skills and Drills and Proper Use of Hip), David Watson-Jones (Escrima) and 4th Dan, Matthew Chandler (Extreme Forms and Kicks). Masters and school owners offered a diverse assortment of skills and specialties such as: Stacy Busby (Fundamental Mechanics of Basic Techniques), Mark Chandler (Shil Ki for Pyung Ahn Forms), Michael Jett (Basic 9 Self-Defense and Breaking), Chris Chisum (Focus Mitt Skills and Drills), Chris Watson (Women's self-defense), and Rachel Chisum (Self-Defense Mindset - Tapping your Inner Beast, Parts I & II). Grandmaster mentored and taught advanced hyung to Sah Dan Masters and then later that evening to Oh Dan and Yuk Dan instructors. He also conducted multiple Healing Warrior Society classes including Walking Meditations/Stretching and Mobility, and Guided Meditations. While there is ample time for the improvement of one’s self through focus and training, one of the many things that makes the camp unique is the sense of community. You will frequently see campers in conversation, shaking hands, and hugging as friendships and camaraderie are established and in many cases rekindled. Whether it happens during training, over a meal, around a campfire or just laughing together during a movie; it is one of the things that makes Black Belt Camp so special. Sense of community is an essential ingredient that keeps martial artists coming back year after year, and it was on full display in 2018. After a full day of training on Saturday and a welcome meal, Federation members from across the region gathered in the Environmental Center to learn from Grandmaster’s insights and experience on “Becoming a Peak Performer.” Speaking from the heart, Grandmaster St. James urged both campers and chaperones to pursue excellence and that if they want change in their lives, they have to be the change. Master Sandberg followed with a timely and needed presentation on Moo Do Protocol. Training, gaining new knowledge, and adding to our skill sets is undoubtedly important. However, so is the need to have fun and there were plenty of options on the table for younger campers. While Masters and school owners were immersed in a Ko Dan Ja meeting in the executive conference room, kids had time to have some serious fun on Saturday afternoon. Ziplining, archery, and putt-putt were all available as welcome distractions for campers and chaperones. For anyone who simply couldn’t get his or her fill of training, there was good news…more training was available at the pavilion! After a group picture and a final round of concurrent sessions on Sunday morning, it was time for what many feel is the capstone of Black Belt Camp. One of the longest and best traditions was at hand; group forms to the drum and belt promotions. This year Grandmaster St. James selected Sip Soo as the hyung of choice. While some students had not yet learned Sip Soo, there were plenty of Masters on hand to guide them through the form. The end result was excellent effort and outstanding Moo Do spirit. 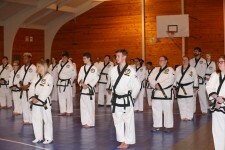 After promotions were awarded to five Black Belt students that had successfully completed their probationary period, came the final highlight of the Camp. Master Rachel Chisum was promoted to the rank of Sunim Sabom Nim, 5th Dan Senior Master. All who know Master Chisum and her love of the Art, passion for teaching, service to the Federation, and humble spirit, know that her promotion was both well earned and deserved. The 2018 Southeast Regional Black Belt Camp was a great success and couldn’t have ended on a better note.